Summer is the season of sweet, juicy Texas peaches, one of the Lone Star State’s most prized crops. Although canned and frozen peaches are available year-round, most brands are not the coveted, tree-ripened fruit grown on Texas soil. The Hill Country is particularly famous for its peaches but it’s not the only source. In addition to “you-pick-’em” orchards around the state and farmers markets inside city limits, several Houston restaurants are currently serving dishes and drinks highlighting the treasured fruit. Fresh peaches are seasonal and therefore available for only a few months each year. The 2018 season is soon winding down, so diners should indulge in peach dishes and drinks while it is still possible. Due to limited availability, do call ahead to ensure the item in question is still on the menu. Chilled Sweet Corn Bisque at Rainbow Lodge, 2011 Ella Boulevard: This velvety soup starter — which happens to be on the Houston Restaurant Weeks menus for brunch, lunch and dinner August 1 through September 2 — showcases both fresh corn and peaches. (Rainbow Lodge is closed on Mondays, which coincides with the final day of HRW this year.) 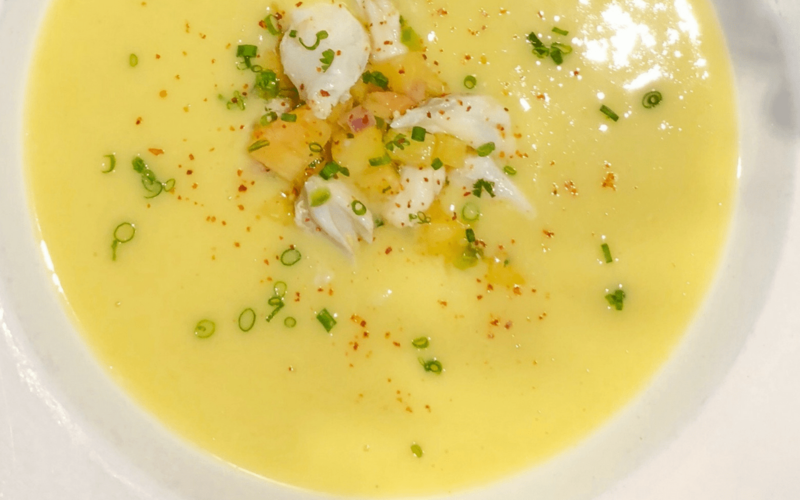 To make the sweet corn bisque, chef Mark Schmidt and his staff grills fresh corn in the husk and combines the kernels with vegetable stock that gets lots of flavor from spent corn cobs. Instead of flour or milk, Rainbow Lodge uses potatoes to thicken the soup, making it both gluten- and dairy-free. Here’s where the peaches come in: after the soup is pureed, it’s run through a fine sieve, chilled and gets a topping of “ceviche” made from gulf lump crabmeat, fresh diced peaches, red onion, jalapeño, lime and cilantro and a final flourish of popcorn spiced with smoked paprika and Piment d‘Espelette (French red chili powder). The peaches come from Efurd Orchards in East Texas near Pittsburg as available. Rainbow Lodge also purchases fresh peaches from Covey Farms in neighboring Louisiana. 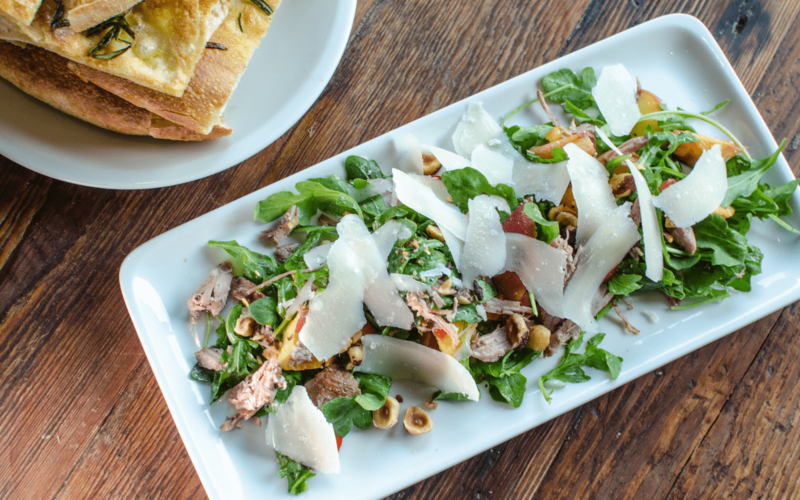 Duck and Peach Salad at Coltivare, 3320 White Oak: As regular as the summer season, James Beard-nominated chef Ryan Pera makes a variation on this salad at his Heights restaurant each year. This rendition combines tender duck breast, Texas peaches, bright garden greens grown on the restaurant’s property, tangy pickled sweet peppers and nutty pistachio vinaigrette. The peaches hail from Lightsey Farms and the specific varieties available change throughout the summer. Peach Agua Fresca at Tacodeli, 1902 Washington Avenue: A traditional drink in Mexico, aguas frescas are exceptionally refreshing and a yummy to way to say hydrated while enjoying seasonal produce. Tacodeli prepares a regular rotating lineup year-round to highlight whatever is in season. For its peach agua fresca, peaches from Stonewall and Winona Orchards in Winona are boiled down, blended with mint and cooled. The purée is then added to water and sweetened with a touch of organic evaporated cane juice. 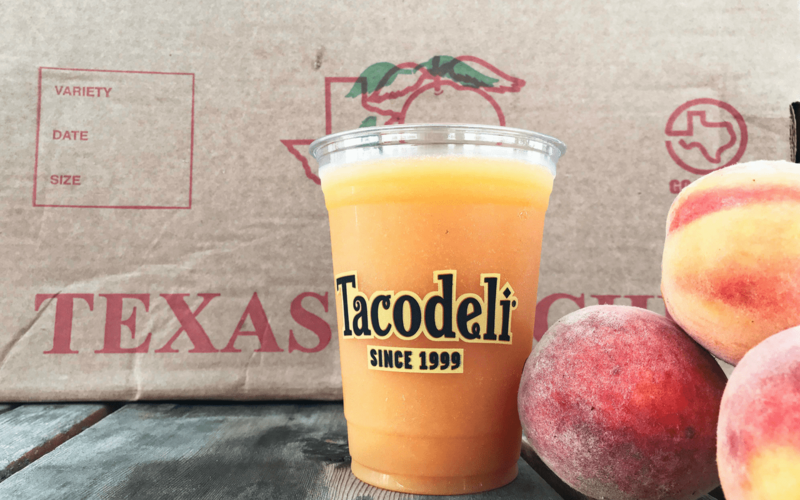 The peach agua fresca is available at Tacodeli through the end of August. 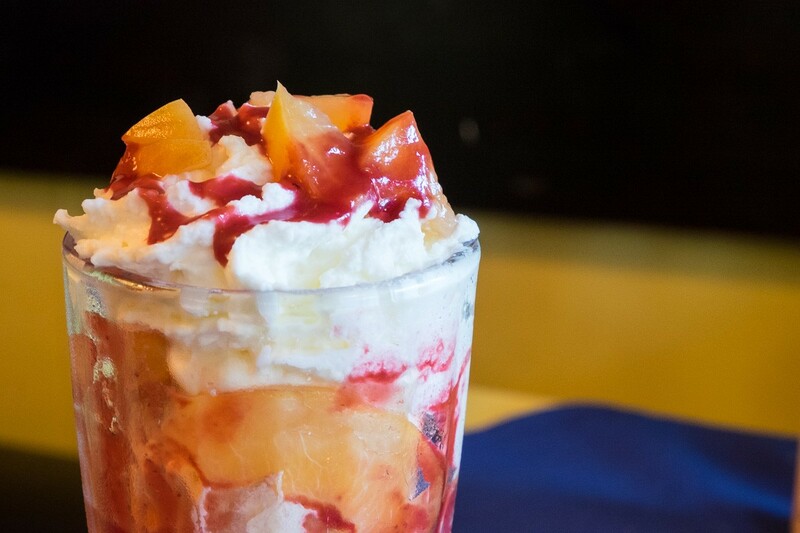 The Peach Melba parfait at Bistro Provence. Photo by Phaedra Cook. Pêche Melba at Bistro Provence, 13616 Memorial Drive: Two fruits join forces in this sweetly modern French dessert at one of Houston’s most charming cafes. The star of the show are peaches from Gillespie County, which includes the Hill Country towns of Fredericksburg and Stonewall. To make the dessert, a peach is peeled, poached in vanilla syrup and halved before crowning two scoops of peach ice cream. Housemade raspberry syrup, whipped cream and toasted almonds are the finishing touches. 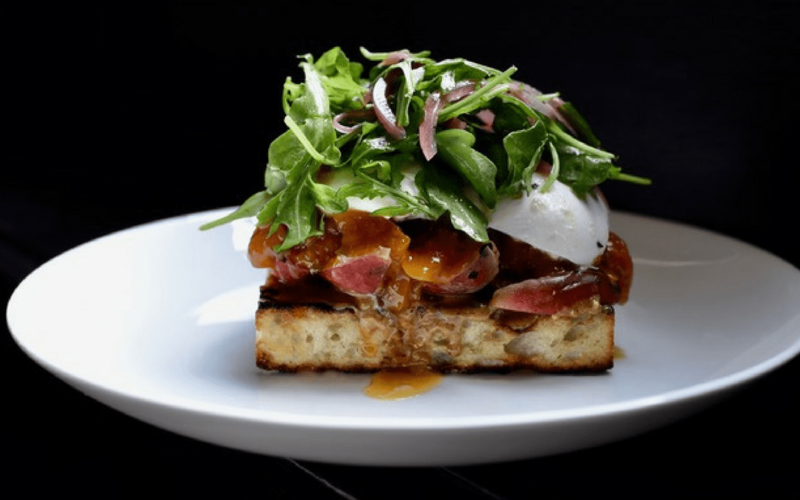 Peach Burrata Toast at Killen’s Steakhouse, 6425 Broadway: The swanky Pearland steakhouse from 2018 James Beard Award semifinalist chef Ronnie Killen serves a peachy showstopper of flavors and textures. Spicy-sweet Texas peach pepper jelly and thick peach slices contrasts with rich, housemade walnut butter, creamy burrata and peppery arugula all loaded onto grilled bread. Peach Panna Cotta at Third Coast, 6550 Bertner: This visual stunner is available on the dinner menu during Houston Restaurant Weeks from August 1 through September 3. 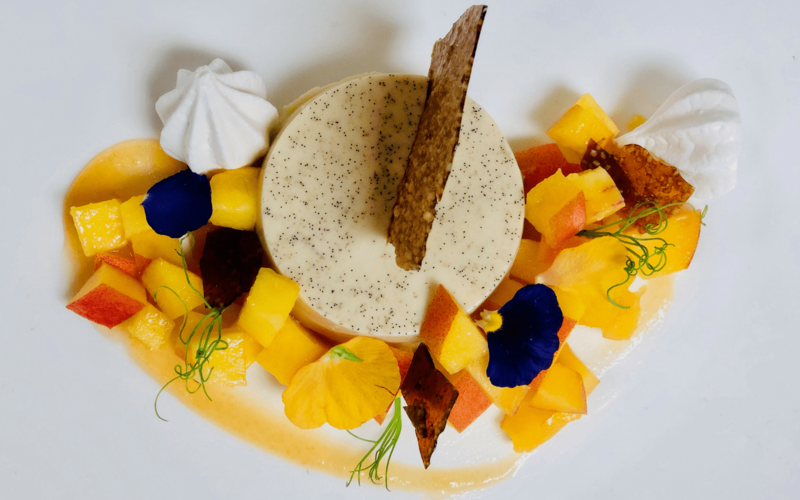 As colorful as an artist’s palette, the dish adorns creamy peach panna cotta with white chocolate mousse, peach gel and bite-sized chunks of dehydrated short cake. Executive chef Jon Buchanan sources peaches from Cooper Farms in Fairfield, Texas. 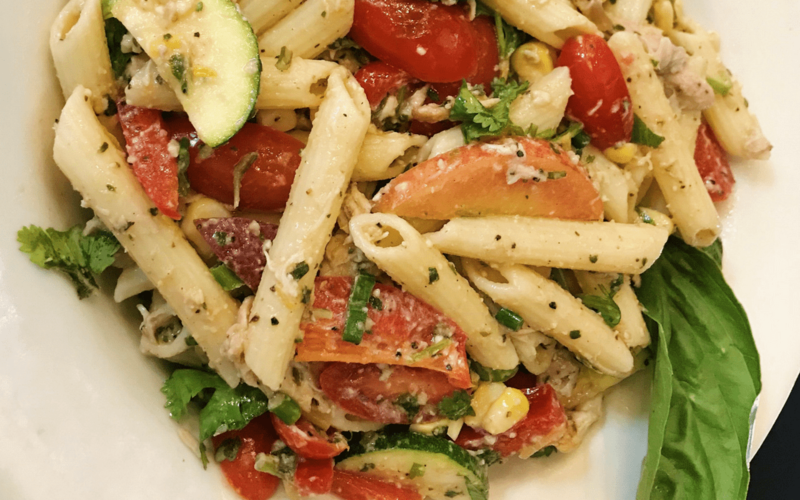 Farmers Market Pasta Salad at Treebeards, multiple locations: It’s tempting to pass up salads in favor of staples like red beans and rice or gumbo at this southern fare mainstay, but in this case, give that a second thought. For the Farmer’s Market Pasta Salad, Treebeards’s cooks source Loring and freestone peaches from Tyler, depending on what’s available. To make the dish, the sliced peaches are tossed with fresh corn, zucchini, red bell pepper, roasted chicken and grape tomatoes. The whole shebang is then bathed and marinated in housemade Parmesan vinaigrette and tossed with warm pasta. 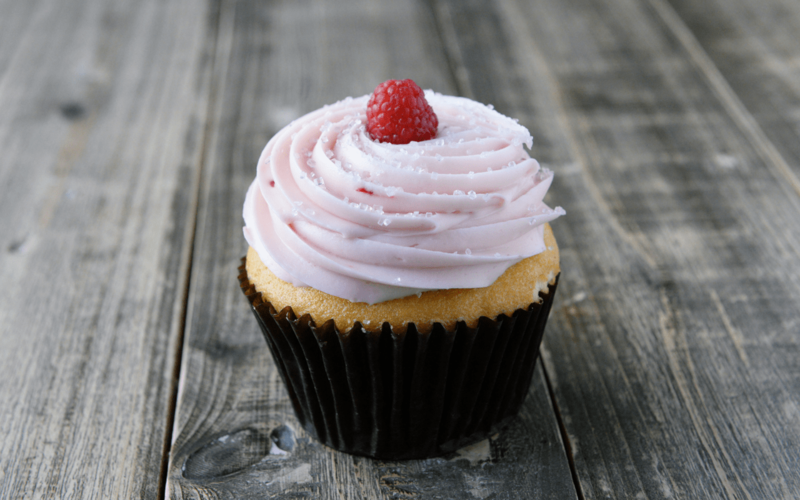 Peach Melba Cupcake at Ooh La La Dessert Boutique, multiple locations: Fridays are generally cause for celebration but this special seals the deal. Bakers fold fresh peaches into vanilla batter and top it with raspberry buttercream to create a hefty-sized treat.